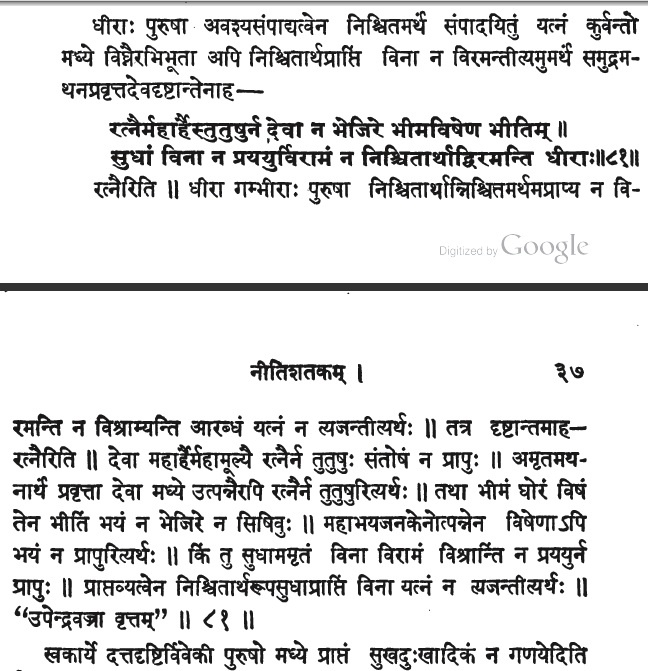 ३.१ देवाः महा-अर्हैः रत्नैः न तुतुषुः | = Gods were not feel pleased with great jewels. ३.३ सुधां विना विरामं न प्रययुः | = (They) did not rest until they got nectar. ३.४ धीराः निश्चितार्थात् न विरमन्ति | = Those who have capacity to stay focused do not rest away from predetermined objectives. ४.३ In the first line all विसर्गाः except the last one have become the sound “र्”. That makes some alliteration अनुप्रास । Also in the second line three successive words have starting sound “भ”. One is left wondering at the poetic capabilities of these poets to compose meaningful verses conforming to meters, weaving alliteration, adding apt illustrations and leading to eternally valid morals, verses which can be sung by anybody even if one does not have a musical voice ! It all becomes so easy to commit them to memory. Do not allow us to rest. Keep us to our pledge. This is what this सुभाषितम् also emphasizes. ४.५ This सुभाषितम् underscores laudable characteristics of people with grit and determination. This is explained by the example of how Gods undertook churning of the ocean क्षीरसागरः to get nectar of immortality. These are not jewels of the ordinary sense. These are all unique by themselves, hence jewels. That is why they are called as महार्ह in the सुभाषितम् of this lesson. As can be noted in the above श्लोक, अमृतम् i.e. nectar is listed last. And getting nectar was the objective of the whole exercise. The exercise was carried on until the final objective was achieved, not being distracted by the unique “jewels” which emanated also undeterred by the poison, which also emanated. शिव dared to consume the poison. To quell the effect of the poison he tied a snake around his throat and wore the moon on his head. The poison burnt his throat dark blue and he became known as नीलकण्ठ ! Effect of the poison was finally quelled by his uttering रामनाम ! The story has traveled around the world. At the Bangkok airport in Thailand they have erected a marvelous scene with idols of Gods and demons churning the ocean. ४-६ Because churning of the ocean yielded the jewels, an ocean is called also as रत्नाकरः one who makes jewels ! We have studied earlier सुभाषितानि where there was reference of pearls being formed in sea-shells by drops of rain when constellation स्वाति is in the skies. ४.७ The next 82nd सुभाषितम् in नीतिशतकम् is also on the same theme. We can study that in the next lesson. ← कस्मिन् काव्ये भगवान् “सर्व” इति संबोधितः ? This must be a typing mistake. you have included where it is correctly printed. 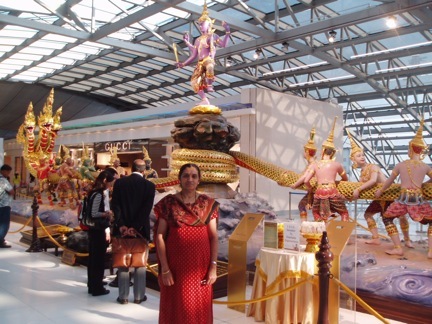 The photograph of the Samudra-Manthana scene at the Bangkok airport reminded me of several things that I had seen in Bangkok when I visited that city some years ago. Among them was a large statue of Lord Shiva in a public square and the story of Ramayana narrated through pictures in the temple of the Emerald Buddha. The ancient capital of Thailand, prior to Bangkok, was called Ayuthaya and the name of the current dynasty is ‘Rama’. The current monarch is Bhumibol Adulyadej ot Bhoomibal Atulyatej. The numerous ‘wats’ or temples of Buddha are exact replicas of similar temples you see everywhere in India. Close to where I live in Toront, there is a restaurant of a popular Thai chain. In the dining hall, as a part of the decoration, is a brass moorty of a four-headed god. He is our own Brahmadeva, though the Thai owner had no clue to that fact.